Cheese up your meatloaf with this cheese stuffed, cheese sauced version of the old family favorite. Cheeseburger meatloaf for dinner! Get ready to serve up seconds and thirds. This is one of those recipes that lurked around in the back of my mind for ages. I could see exactly what I wanted it to be…a meatloaf full of classic cheeseburger fixings…relish, mustard, mayo, ketchup…then stuffed with cheese on the inside and drizzled with cheese on the outside. There it was, in living color in my imagination, and I didn’t make it for the longest time because I was worried that the real life cheeseburger meatloaf wouldn’t hold up to the one in my cheeseburger-loving mind. But then one day I got brave and made it….and it was all I hoped and dreamed it would be. Phew! I will start by saying that this is a recipe where Velveeta is absolutely called for. I know you might be all tempted to use cheddar, and I completely sympathize with that instinct because I am a cheddar lover too (hello Cabot! ), but in this recipe you want the completely reliable creamy melting that you get from Velveeta. Now that we have that settled, let’s talk about the actual meatloaf. If you can get that combo of beef/pork/veal that some markets have started packaging together that is ideal…if not, plain ground chuck is just fine. Mix it up with some bread crumbs and an egg….AND a bunch of things that you would usually put on top of a cheeseburger. Onions. Mustard. Ketchup. Mayo. Relish. Oh yeah. Next, you want to make a meatloaf rectangle on a piece of wax paper or plastic wrap. Your rectangle should be about 8 inches by, oh, 12 inches or so. And about 1/2 inch thick. It doesn’t have to be precise – just mush it around until it is roughly that size. Now put a nice handful of Velveeta cubes in the center. Starting from one of the short ends, roll it up, using the wax paper or plastic wrap to help you guide the meatloaf. Pinch the ends together to seal it up, and put it seam-side down in a loaf pan that you have lined with foil that you have poked a few holes in (the holes will let the fat drain out when the meatloaf is done. Now pop it in a 350 degree oven for an hour. Once the meatloaf is done, you’ll want to let it sit for about 10 minutes while you make the sauce. The cheesy wonderfulness inside makes this meatloaf not as solid as regular meatloaf, so it needs this time to settle a little. And you need this time to make the sauce! Cheese up your meatloaf with this cheese stuffed, cheese sauced version of the old family favorite. Cheeseburger meatloaf for dinner! Get ready to serve up seconds and thirds.Click to TweetWhich is a quick concoction of butter, flour, half and half and yes, you guessed it…Velveeta. It comes together quickly on your stovetop, and by the time you’ve finished it the meatloaf will be ready to slice. Lift it up carefully, using the foil edges as handles, and either slice it right away or for MAXIMUM drama, carefully slide it onto a platter. You can either drizzle the cheese sauce on right then and there, or let folks do their own drizzling. I served mine with french fries on the side (I figured in for a penny, in for a pound. Or probably more accurately, pounds. But hey.) And let’s just say that it’s going to be very, very, very, very, very hard to go back to plain meatloaf. Cheese up your meatloaf with this cheese stuffed, cheese sauced version of the old family favorite. Preheat oven to 350. Line a loaf pan with foil, letting the foil extend over the sides and poking a couple of holes in the bottom. Mix together all meatloaf ingredients except Velveeta. Lay the mixture on a piece of wax paper or plastic wrap and press it into a rectangle approximately 8 inches by 12 inches and 1/2 inch thick. Scatter the cheese cubes on top, leaving about 2 inches on all sides. Starting from the short side, roll up the meatloaf, using the wax paper or plastic wrap to help you. Pinch the ends and the seam together and place it seam side down in the loaf pan. Bake for one hour. Take it out and let it settle in the pan while you make the sauce. Melt the butter in a medium saucepan over medium heat. Stir in flour until well combined. Whisk in half and half and bring the mixture to a boil. Stir in cheese and keep stirring until it is melted and smooth. Pour into a heat-proof measuring cup or pitcher. Using the ends of the foil, carefully lift the meatloaf out of the pan, letting the fat drain off through the holes in the foil. Transfer to a platter. Cut in slices and serve, either drizzling with cheese sauce first or letting folks add their own cheese sauce. Spiffed up from a previously published Framed Cooks post! I love all of your recipes and site but I’m sorry, this sounds and looks very unappetizing! Oh my gosh this looks amazing!! 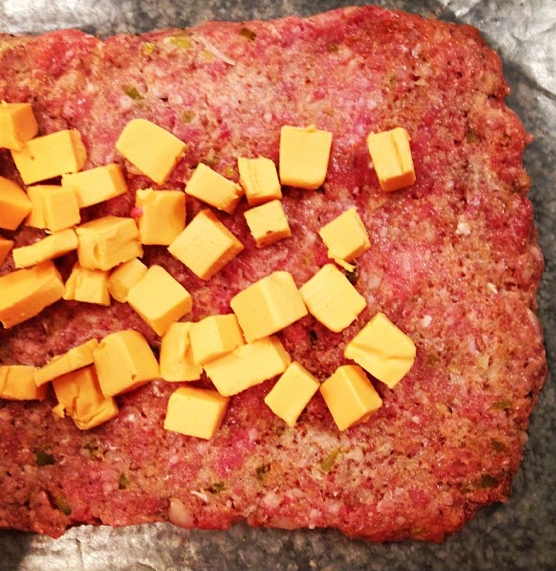 Cheeseburgers are my favorite thing and combining it with meatloaf sounds incredible! I cannot wait to make this for friends!! You are right! I will try it. I bet it will be good …can’t do the velveeta though. I’ll let you know! Great! I’m so glad you are giving it a try. I have been dreaming about this recipe ever since you posted it last week and I can’t seem to stop thinking about it. I think that means it is time for me to cook it and let me dreams come true! Thanks for the recipe! My pleasure and sweet dreams! !